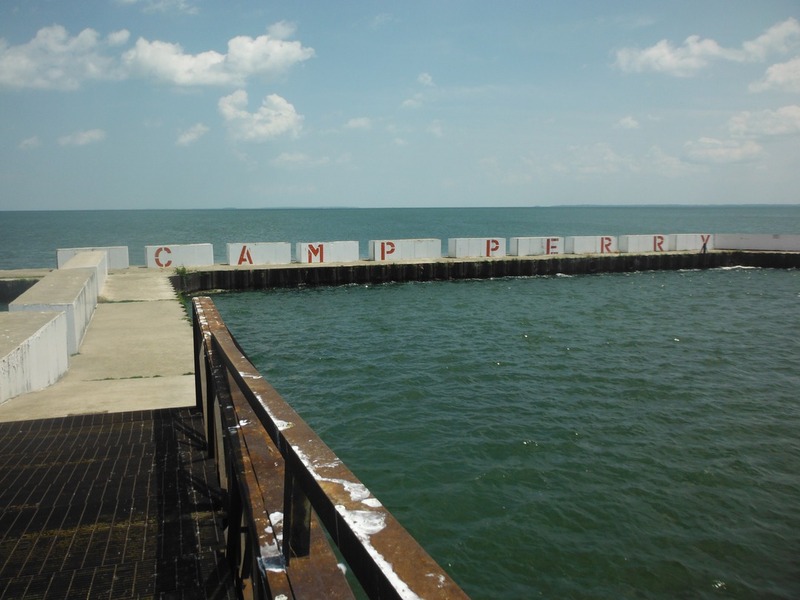 Camp Perry Beach is seven miles west of the Port Clinton City Beach in Port Clinton, Ohio, on the southern shore of Lake Erie. 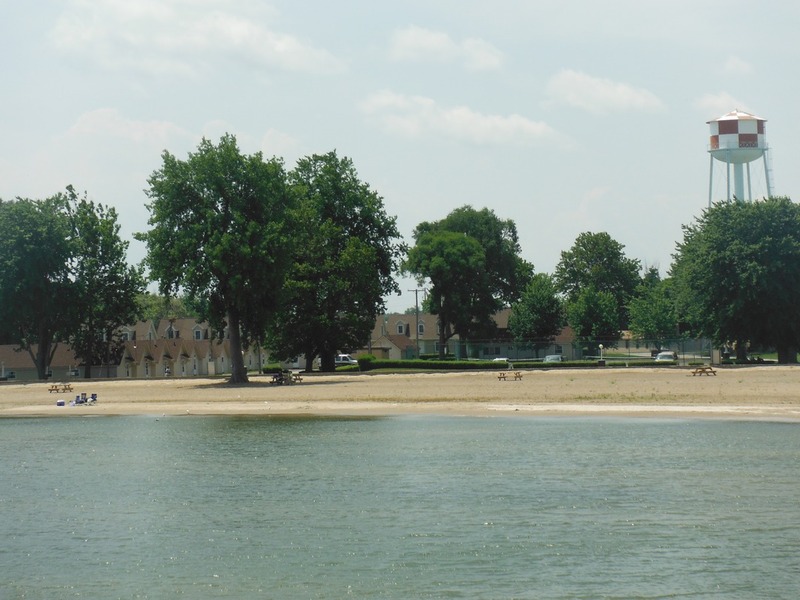 The Camp Perry Military Reservation is home to the Ohio National Guard, a whole lot of history, and an amazing beach that's free and open to the public. This view, heading north, greats both military and civilian visitors to Camp Perry Beach on Niagra Road. Also on Niagra Road are mounted tanks and rockets, which undoubtedly have stories to tell. The second silo, on the lower left, is closer to the beach on Scorpion Road. 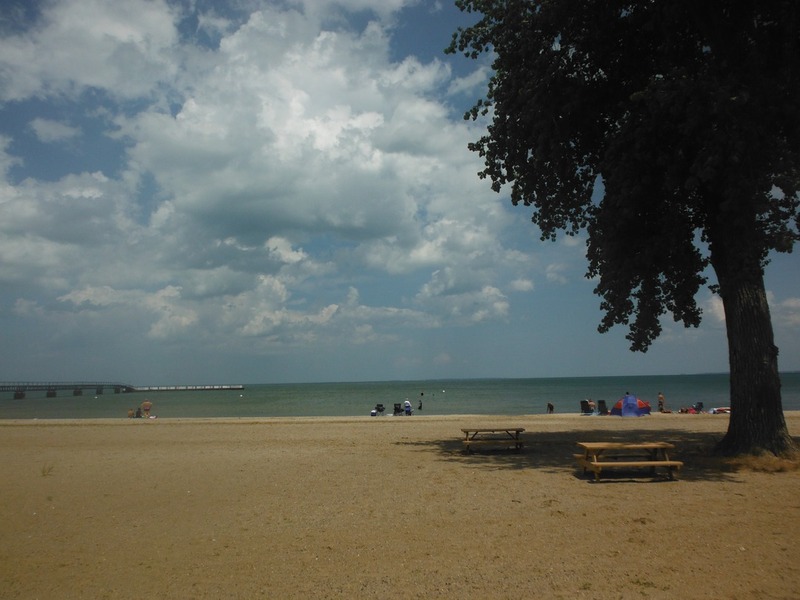 This is Camp Perry Beach, with glittery water and a wide shoreline, at about noon on July 2nd, 2014. There is ample parking just beyond the sand wall in the background. The cottages and condos just past the parking lot can be rented by the public, but military personnel get a discounted rate. This conference center was rebuilt in the mid 1990's. It is spacious and comfortable and can be rented for gatherings. On the viewer's right, in the shade, are sea-shell themed wrought-iron tables and chairs. 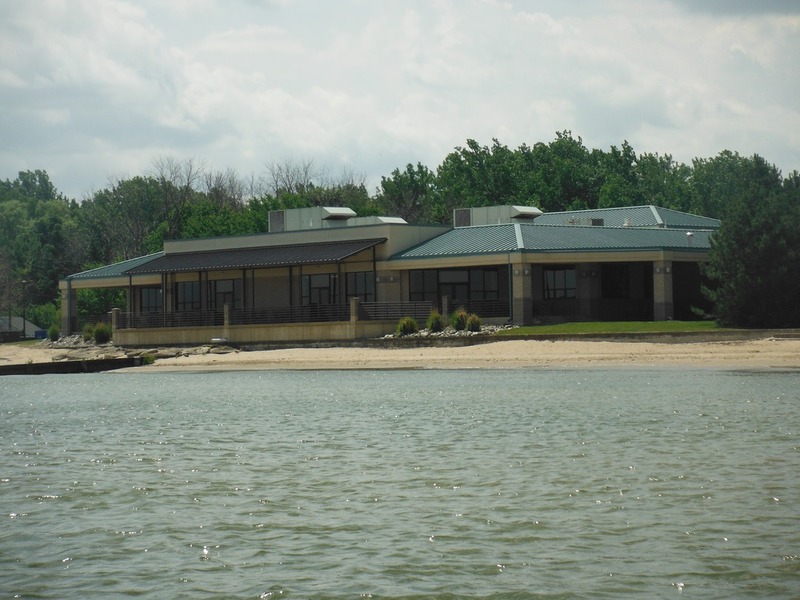 This facility replaces the camp clubhouse, which was in use from 1907 through 1993. 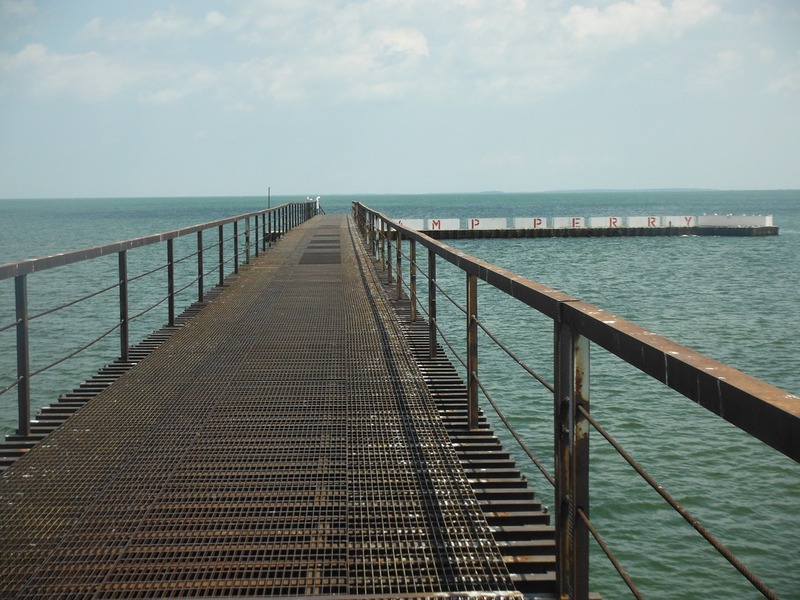 This jetty leads to the Camp Perry fishing pier. 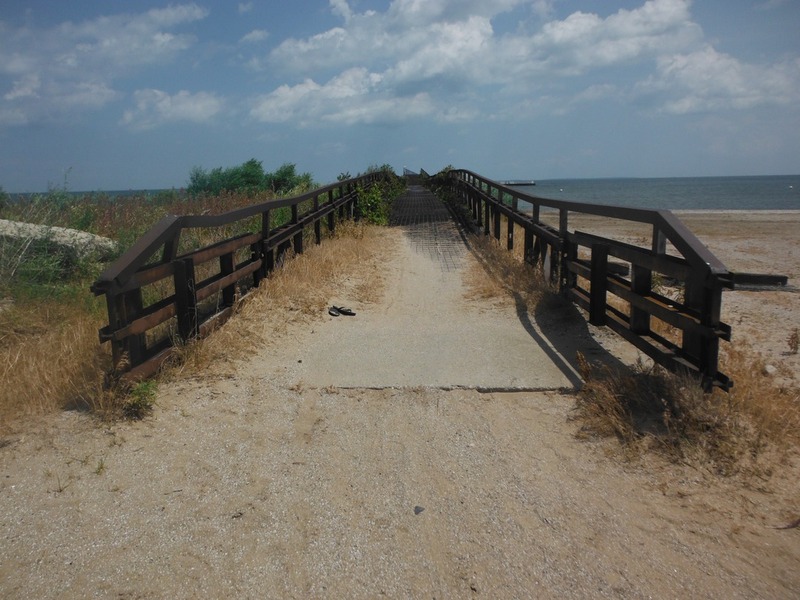 This elevated walkway provides a most excellent view of both the beach and the surrounding fields. 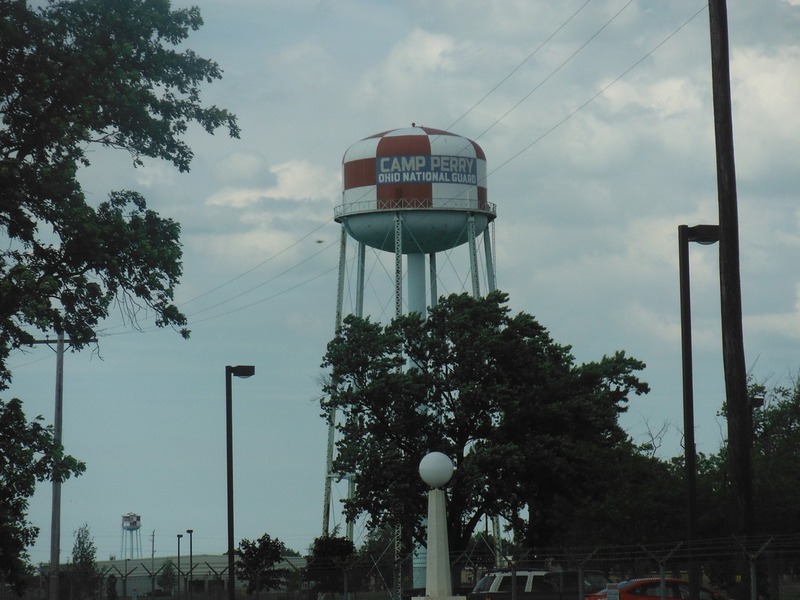 (It was built by an engineering battalion at the camp.) Sturdy footwear is recommended for this no-frills structure, as the metal grates get hot in the sun. Some of the grates on this structure are a little loose, and the whole thing could use fresh coat of paint. But this is one of the most fun parts of Camp Perry Beach. Once over the top of the hill, it's all islands, water and sky. The PVC periscope on the left is for the recycling of monofilament fishing line. 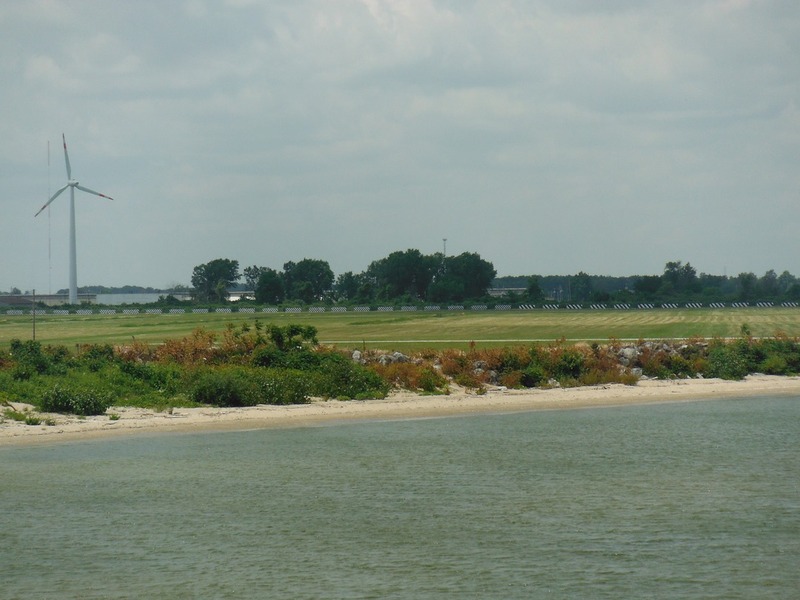 Though obscured here, the Perry Monument is toward the right of the image on South Bass Island (looking northeast). Directly over the "p" in "Camp" is Ohio's Green Island. 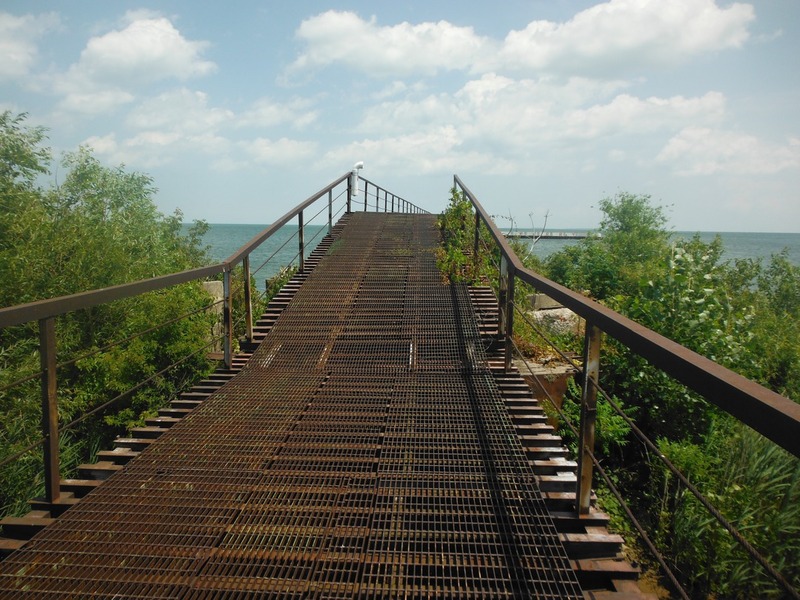 An automated light was installed in 1939, and previous lighthouses were abandoned. This island is not open to the public. 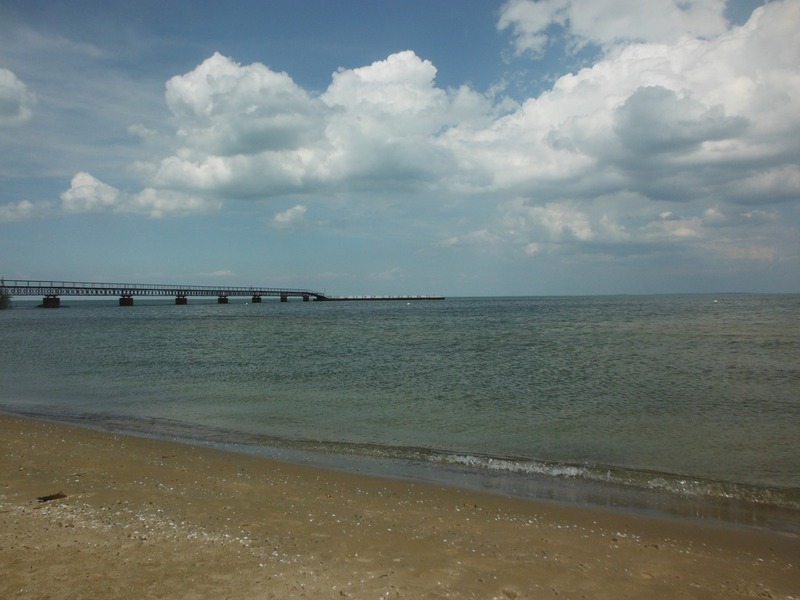 This is the fishing pier at Camp Perry Beach. There's ample room on both sides of the letterblocks to set up folding chairs and set down a cooler. The small sign on the very right hand side reminds visitors that this is a National Guard base: "No Diving from Pier per Garrison Commander." This view of the fishing pier looks northwesterly. It was windy with temperatures in the low 80s under partly cloudy skies. 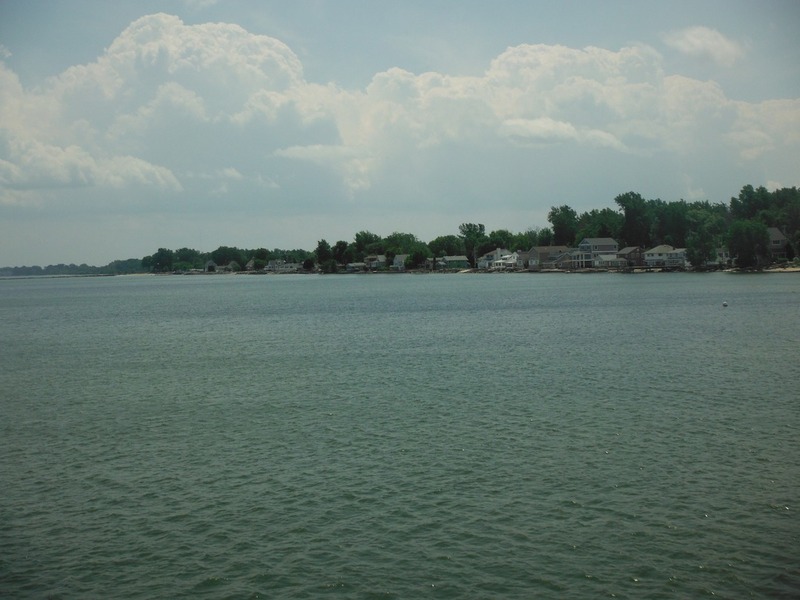 The tiny white dots in the lake (one in front of the walkway, one directly in front of the fishing pier, and one off to the right) are swimming buoys. The water is waist-high and cold. This view looks toward the shooting ranges at Camp Perry Beach as seen from the walkway. The Civilian Marksmanship Program has had its National Matches here every year since 1907. There are 6,000 attendees. The ranges are beyond the berms and point toward the water and are fenced off. This view looks east, and the homes in this image are not part of Camp Perry. 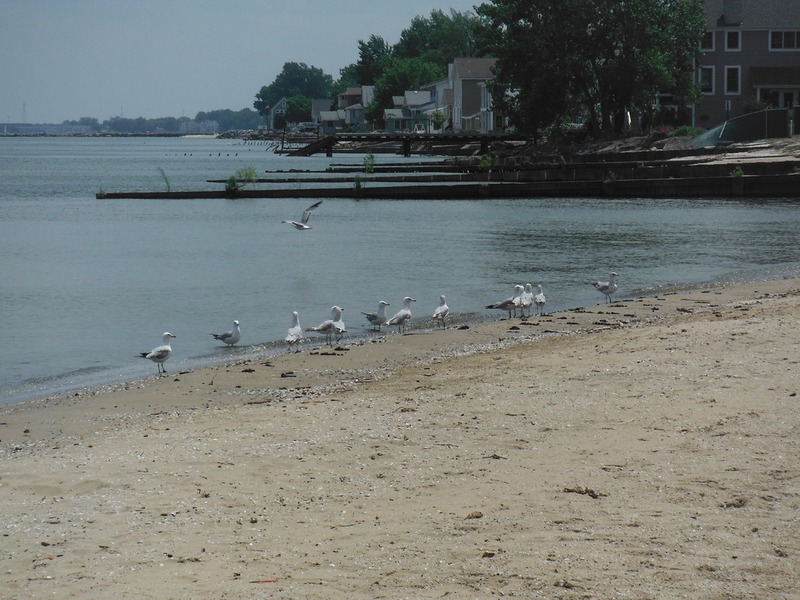 This area, right in front of the conference center, is a beach gull favorite. The gulls here easily outnumbered the soldiers in uniform who occasionally strolled along the shoreline. This image was taken at one of the swimming buoys anchored in the water. This view looks southeast. These homes are on a quiet dead-end street, and several breakwaters run east to west along this stretch of the beach. One last look at Camp Perry Beach from the sand wall sees that quite a few families came out to enjoy it by late afternoon. Kids who ride their bikes along Scorpion and Critchfield roads get this view each time they peddle past. This is a great place to trade tactical boots or work shoes for flip-flops.